Princess Ayako is engaged! Her husband-to-be, age 32, is an employee at major shipping company NYK Line in Tokyo. Press conference soon? this afternoon? (already the 26th in Japan, unclear google translation). Wedding this autumn. ETA: NHK reports the couple met this April when he was invited to a party at Takamado residence. Wait, did I understand this right? They have known each other for two months and are getting married this autumn? Are they not going a bit too fast? I wish all the best for the couple, but still! She's following her parents' example, I suppose? Hisako Tottori first met Prince Takamado (Norihito) on April 23, 1984 at the Canadian Embassy. He proposed on May 20th, their engagement announced on August 1st, and they married on December 6th. All in 1984. Yomiuri and Asahi updated their articles: official announcement and press conference on July 2nd. Wedding ceremony on October 29 at Meiji Shine. ETA: Sankei reports Ayako and her fiance met last December via an introduction from her mother. ETA: Nosai no Gi (formal engagement ceremony) will be held on August 12 [news24.jp] which also reports the couple met last December so NHK appears more and more incorrect. FNN info and photos of the couple. Ayako's kimono is lovely! Kei Moriya graduated from Keio University. Every year Princess Hisako attends events for NPO KnK International "Children without Borders" where Kei’s mother Kimie was secretary general and then senior director. Princess Hisako met Kei for the first time 10 years ago at a "Children without Borders" photo exhibition. Last November, she met Kei again at the organization's 20th anniversary celebration where he mentioned interest in international welfare activities. Thus, Princess Hisako introduced Kei to Ayako in December. 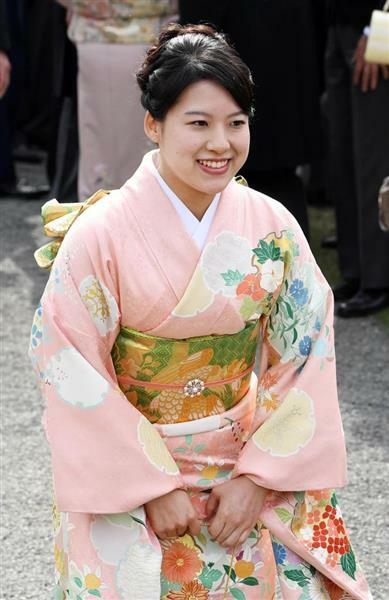 Princess Ayako has a Masters in social work from Josai International University and is currently working as a researcher at the Faculty of Social Work Studies Josai International University. Correction: Kimie Moriya passed away in July 2015. Blindingly fast courtship and engagement. They will be marrying after 10 months knowing each other. So in October there will be two weddings of the Princesses born in 1990! Another wedding to look forward with Princess Eugenie of York and now Princess Ayako getting married ! Congratulations to Princess Ayako and Mr Moriya! That is a whirlwind engagement. I am looking forward to seeing photos of various ceremonies that accompany engagements and weddings in Japan. That seems like a very quick courtship, especially in terms of Ayako being member of the Imperial family. They are a very attractive couple, and I'm looking forward to seeing the photos of the formal engagement and the wedding. Will Ayako lose her imperial status? Yes, she will. Just like all the Japanese imperial princesses marying outside the Imperial Family itself. The only chance a princess retains her title and status is when she marries a fellow Imperial family member. Thus, the only possible match of this kind for me, now, is Aiko marrying her paternal first cousin, Hisahito. Eventually, we should expect that all of the girls would marry and there will be only the Emperor, his brother and nephew. And their wives, of course. Maybe Akiko will be single? She is the now the senior princess of her generation and works quite a lot. Japanese Imperial princesses lose their official imperial status when they marry. For example, Ayako's sister Princesss Noriko became Mrs. Noriko Senge upon her marriage. I think she lost it because Kunimaro is not an aristocrat. She lost it because her husband is not member of the Imperial family and thus a commoner. Since 1946, there are no aristocrats, official nobility in Japan. All titles of nobility or rank outside the immediate Imperial Family were discontinued to use and the Kazoku, hereditary peerage (based on the British, I suppose), was abolished. Also, collateral branches of the Imperial House were abolished and succession was limited to the male line male descendants of Emperor Taishō. Thank you, Prisma! 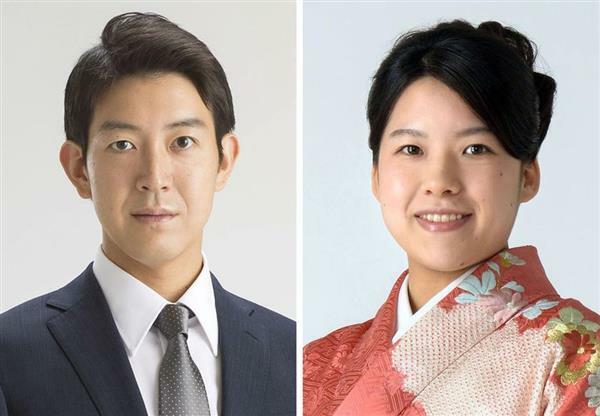 I never knew Prince and Princess Takamado were acquainted for only a month (!) until he proposed marriage. None of the marriages in the Mikasa family were arranged, correct? Well, the Takamados' marriage seems to have been happy and I suppose Ayako learned from her parents' example, whether they met 2 or 6 months ago. That's right, but to be precise, the Imperial House Law limits the succession to male line male descendants who are members of the Imperial Family. The collateral branches not descended from Emperor Taishō would be in the line of succession if they hadn't lost their imperial status in 1947. How is the wedding venue decided? I'm curious about why Ayako will marry at the Meiji Shrine whereas Mako was supposed to marry at the Imperial Hotel. very excited for ayako and her dashing husband to be! were there official pictures when noriko got engaged? now there is only tsuguko left, i am sure we will hear of the good news soon! Congratulations to the couple and their respective familie's. Kei Moriya’s father Osamu (62) worked at the Ministry of Economy, Trade and Industry. His mother Kimie was a senior director at KnK International "Children without Borders." She became ill while visiting Cambodia for the organization in July 2015 and died after transferring to Thailand. Kei succeeded his mother's position at KnK this March. Princess Hisako is also acquainted with Osamu Moriya as he was in London in 1975 when she studied aboard at Cambridge University. Kei spent his kindergarten period in Paris and also studied abroad at Oxford University while enrolled at Keio University. He lives with his father and grandmother. He's been working for NYK since 2009, where he's in charge of wood chip transportation, and was featured that year in the company newsletter. A colleague says Kei is proficient in English and believes he’ll be a serious and good husband like his work. Media began gathering at Moriya's apartment building in the afternoon; they waited several hours as Kei returned home after 9:30pm. He didn’t say much, thanked the crowds and media’s “congratulations” and bowed. Cello instructor Yoshihiko Terada was among those congratulating the couple. In August 1993, Mr. Terada began giving cello lessons to Prince Takamado who wanted to start learning before turning 40. While her sisters Tsuguko and Noriko selected violin and piano, Ayako wanted to learn after listening to her father's cello sessions. Mr. Terada remembers Ayako practicing hard in front of a large mirror in a reception room at the Takamado residence. She was serious from a young age. When Prince Takamado suddenly passed away in November 2002, Mr. Terada and Princess Ayako played cello in front of his coffin before the general viewing. She continued cello lessons until university. Mr Moriya's family has an impressive CVs. It is unfortunate that Mrs Moriya passed away.